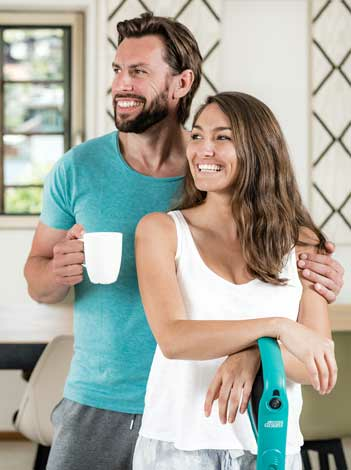 The durability of central vacuum systems, which by far exceeds that of conventional vacuum cleaners, ensures a further positive effect on the ecological footprint of the building. One of the most significant challenges when planning and using a passive building is ventilation. For this reason, we wish to elaborate here on the use of central vacuum cleaners in passive buildings. It is known that adequate controlled ventilation can be achieved when the air is circulated 0.4 times per hour. In this way, the air in the space is completely re-cycled every two to three hours. Better air quality (humidity level, amount of CO2, amount of volatile particles in the air) has been recorded in buildings fitted with a central vacuum system. In this way, in buildings with central vacuum systems, the airflow can be shut down and thus the cost of heating be reduced by up to 20%. By using sensor controls, this can be done automatically. This is yet another advantage of having central vacuum systems also (and especially) in passive buildings. Let us consider some things about airflow. A central vacuum system carries on average around 100 m3/h, which corresponds to double the amount of that of a controlled ventilation system. In addition, we need to consider that the vacuum effect creates around a four times higher pressure than that of a controlled ventilation system. Considerable amounts of air are, therefore, shifted by central vacuum systems. 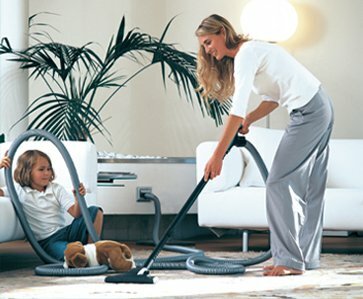 It is necessary, however, to consider the fact that central vacuum systems are generally used only for a short amount of time. From experience, we could say for around 1 minute per 10 m2, meaning that the amount of air circulated is actually relatively small and, therefore, the effect somewhat insignificant. We are currently challenged by the question of whether and in what way a central vacuum system could cause problems in a passive building relating to the combustion of fuel in fireplaces or stoves. As far as we know, no studies on this exist. We will ascertain reliable facts upon consultation with experts in the foreseeable future. At present we have no relative feedback regarding the use of fireplaces or stoves. Reports from customers and debates on the matter have yielded that, in practice, no problems have ever occurred. This has to do, as mentioned above, with the short time span that central vacuum systems are in operation. This is generally sorter than supposed. Furthermore, the air pressure in the room can be quickly increased by opening a window. Opening a window in a passive building is obviously possible at any time, although in principle, not necessary. Considerations in the planning phase in this regard would seem to be theoretical only, whilst in practice, no consequences arise. It must also be said that furnaces in new-builds often have a supply of fresh air from outside. In some regions this is actually a prerequisite or at least highly recommended. A marginal question should also be considered: whether it could be necessary and useful to conduct the air that has been sucked out of the room though a heat exchanger, once it has left the central vacuum unit, in order to recover the heat. It should be noted at this point that the recovery effect far outweighs the technical and energy costs of installing and operating the heat exchanger. We are aware of installations in which the extracted air is retained in the building for energy reasons and channelled into an adjacent room through a HEPA-Filter. We advise against this because HEPA-Filters reduce the overall efficiency of the unit due to their resistance effect. Here, once again, the realistic usage time of a central vacuum system must be taken into consideration: it is, as a rule, much shorter than supposed. LEED certification requirements, which are particularly important in North America and are applied, for example, in hotel buildings, recommend that the vacuumed air be conducted outside and consider the possible loss of heat to be insignificant considering the hygiene effect that is achieved. As far as the Blower Door Test is concerned, central vacuum system must be airtight. In the excess pressure test phase, if the vacuum system has been installed properly, there should be no problem whatsoever in this regard. In the vacuum phase, especially in the case of substandard wall inlets, it is possible that these open and air escapes. The wall inlets used by Disan are fitted with two springs, which keep the inlet closed thanks to pressure of up to 100 Pa. When taken into account the positive effects a central vacuum system has on air quality, hygiene and comfort, as well the significant savings on energy costs they allow, doubts about the effect on air circulation, in particular, become absolutely insignificant.